One of the first pieces I refinished when I began my company was a dining table for our house. At the time, I had a good amount of experience painting with chalk paint, but hadn’t worked with stain that much. Now that I have, I was excited to do a dining set finished with paint AND stain. I do want to mention, for those who are just starting out, even after years of painting and refinishing, there are always lessons learned with each piece I do. Fortunately I’ve learned enough of those lessons on my own furniture that now, I can finish a high quality, durable piece for a client. But I honestly learned so much from reading tutorials online that I sincerely hope my blog can be helpful to other painters seeking advice! So... on to the dining set! My most recent refinishing job was for a client who wanted a farmhouse style table, much like my own. A few of you asked for the products I used on it, so I figured I would link them here so they are easy to find and then walk you through the process. The first step for the chairs was to prep and prime. I use TSP to clean, which is an all-purpose cleaner that gets rid of dirt and grease. 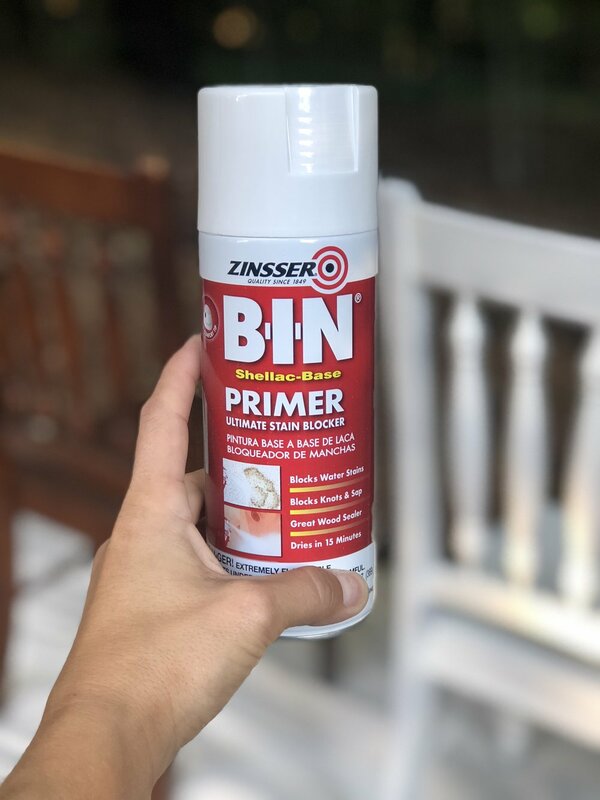 I prime with Zinsser B-I-N Primer, which has a shellac base that keeps wood from bleeding through the white chalk paint. **If the wood does bleed through, NO amount of chalk paint will cover it. Shellac is the only thing that will block it. ** Priming also helps cover the darkness of the wood, so you may not have to use as many coats of chalk paint. After the primer, I applied two thick coats of Annie Sloan Pure White chalk paint. I didn't worry about brush strokes at this point because I knew I was going to sand the chairs all over to make them smooth and distress them. After the paint was dry, I sanded the chairs all over with 220 grit sandpaper. Once they were smooth and distressed, I blew off the chalk dust and wiped them down to make sure they were clean and free of dust. I sprayed them with three coats of Minwax water-based Polycrylic, following application instructions listed on the can. Always use a water-based finish over white chalk paint, as anything oil-based will amber, or have a yellow tint. For the table top, I sanded the top down to raw wood using 80 grit discs on my random orbital sander, finish sanded with 220 grit, then cleaned the wood thoroughly. I applied one coat of Varathane Briarsmoke. This is my favorite stain... it's a brown with a grey undertone and mixes well with browns, blacks, and greys. Once the stain was dry, I sprayed numerous coats of Varathane water-based Polyurethane. I sprayed so many LIGHT coats, I lost count... honestly I probably sprayed at least six coats. You do NOT want this to run, so it's better to spray a lot of coats very lightly than spray too much and have to fix it after. As far as the apron of the table, I followed the same process as the chairs, although I did not prime it. I was super happy with how the set turned out, and my client was as well! Feel free to reach out to me if you have any questions about the process. I always look forward to chatting with you! If you liked this project, please follow us on Facebook @southernpine, Instagram @southernpinerestorations, and PIN this on Pinterest! Disclaimer: This post contains affiliate links. This means, at no additional cost to you, I will earn a small commission if you click through and make a purchase. All product recommendations and opinions are my own and are not paid for nor sponsored.